Pat and Gina Neely and their family own and operate some of Tennessee’s best barbecue restaurants. Now they’re ready to share secrets from their famous restaurant dishes along with their tastiest family-friendly recipes. In “Down Home with the Neelys: The Complete First Season”, watch as the Neelys teach you their favorite family recipes, foolproof dishes for entertaining, and delicious tricks of the trade. With more than fifty recipes on the entire first season’s thirteen mouth-watering episodes, nobody will leave the table hungry! 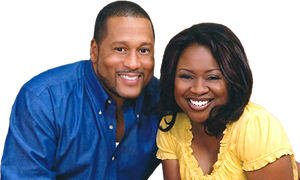 Disc One: Pat and Gina Neely will have your mouth watering with these five great episodes: “Sunday Supper”, “Get Out of My Way (Foods that Gina Craves)”, “Expandable Pants (Pat’s Three Brothers Drop By For Dinner)”, and “We Really Do Have Friends (Pat and Gina Entertaining Friends)”. They’ll be cooking up some of their restaurant’s secret recipes for their entire family, lots of their favorite dishes, and classics for entertaining. You won’t want to miss it! Disc Two: Get ready to learn some of the Neely family’s favorite recipes with four fantastic episodes: “Fast Food”, “If Pat’s A Good Boy (Pat’s Favorites)”, “Sunday Sleep In” and “Pass It On”. From Spicy Chicken Wings and Bacon Breadcrumb Mac and Cheese to Gina’s Famous Cinnamon Rolls and Mama Daisy’s Homemade Banana Pudding, you’ll be coming back for seconds! Disc Three: Save room for four more episodes of great recipes from The Neelys: “Girls’ Favorites: Cooking for the Girls”, “Vacation Bites”, “Game Night”, and “It’s Neely Lunch!”. Learn the recipes for family favorites like BBQ Shrimp and Sloppy Joes, Pulled Pork Bruschetta and Sangria inspired by the family vacation to Spain, great game night nibbles and more! Closed captioned for the hearing impaired. Plus: Barbecue Tips, Bonus Videos, and More from The Neelys.